Linking to: Theme Thursday, November 12th 2015. Soumya, you have very well summarized the post Diwali damage. After a certain age I stopped bursting crackers and now I am really against it. Like you said we literally burn money . That's so stupid of people. So many people are dying hungry and we see so much money spent to create noise pollution. Arghhh! So true and well penned. 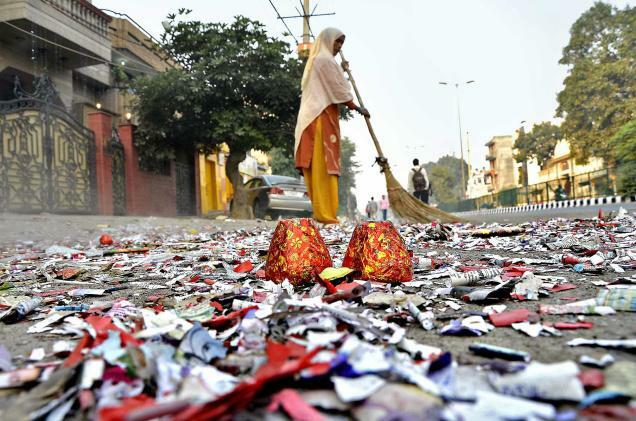 I clicked a picture similar to this one the morning after Diwali and tweeted it. Well, while many shared that this is not being responsible, I also got some nasty replies. Point I am trying to make is, there are people who think this is how Diwali should be celebrated. Makes me sad to think where are we headed? Seriously na? I felt so sad for the sweepers the next day. But then again, who cares? I wish Diwali could be celebrated with more community spirit. Especially lightning crackers can be a community event, done at a common place with everyone being audience and not about personal show off. Nice poem. That would be the best. Like the pandals during Durga Puja. That's so awesome! Do you think India would ever get there? I fear this will never stop. Parents want the kids to 'enjoy'. They don't know whom they are hurting in the process. Ditto! Parents are to be blamed somewhere as well. This is the sad aftermath of one of my favorite festivals. I wish more people understood that Diwali will be just as beautiful (actually even more so) without the bombs and other dangerous firecrackers.